So you must have heard by now that award-winning Macklemore & Ryan Lewis are headed to Yas Island this month! And to celebrate FLASH Entertainment recently announced a unique and exclusive competition for UAE artists and graphic designers which will see them battle it out to design the ultimate gig poster for Grammy award-winning Macklemore & Ryan Lewis’ show on Friday, 25 April at the du Arena, Yas Island. 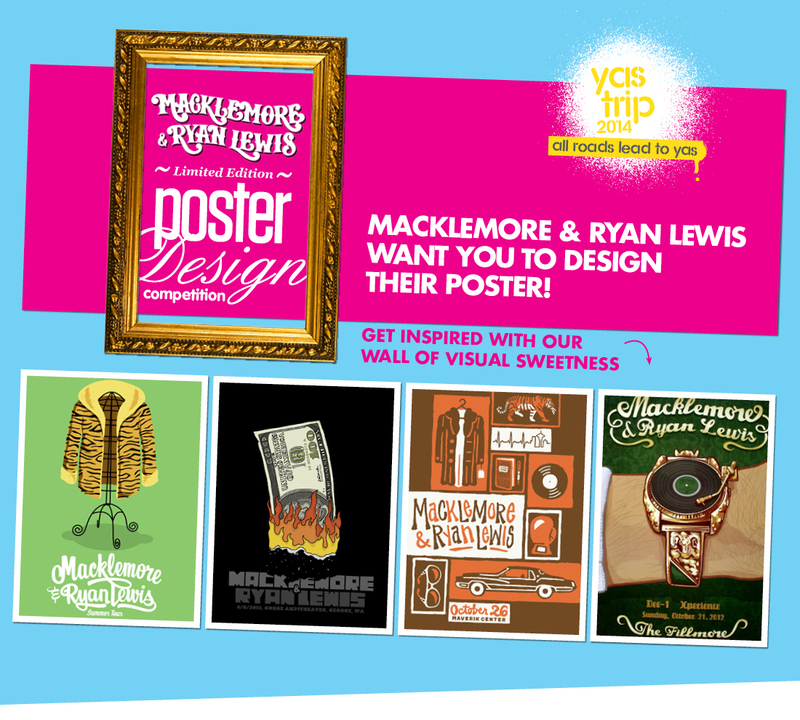 One lucky winner will see their design personally selected by Macklemore & Ryan Lewis who will then sign and frame a copy for the artist to keep! Entering the competition is simple. Participants will be required to design an A2 poster which fits the distinctive style of Macklemore & Ryan Lewis, artists who have built a huge following for their innovation, ideas and lyrics that go against much of hip-hop’s traditional swagger. CHOOSE THEME or IDEA – The strongest designs always start from a simple idea! GET CREATIVE – Visualize your idea, and let the craziness begin. GUIDELINES – These are simple and straightforward. You can download them to the right. SUBMISSION – Make sure to submit your submission form along with your design. You can access them to the right. Submission deadline: April 12 (11:59 pm). Only one submission will be accepted so submit your best design. Full information on the poster specifications can be found at http://info.thinkflash.ae/eposter along with submission rules and regulations. So for all you budding artists out there, this is a once in a lifetime opportunity to have your artwork recognised by some of the world’s biggest artists so what are you waiting for?! Yalla! !